Osteochondromas are benign bone lesions derived from aberrant cartilage. Although osteochondromas represent one of the most common bone lesions, they rarely present in the foot and ankle. We report the case of a patient who presented with osteochondromas originating from the talus and calcaneus, representing a rare case of osteochondromas within the talocalcaneal joint, due to the location of the tumors and proximity of the lesions. After failure of conservative management, this patient underwent surgical excision followed with a planned arthrodesis for symptomatic peroneal impingement and subtalar arthrosis, both likely complications of the osteochondromata. We present this case as an example of the chronic complications associated with osteochondral lesions in hopes of promoting earlier management. 1 – San Antonio Military Medical Center (SAMMC) in San Antonio, Texas, United States. An osteochondroma is a benign chondrogenic lesion derived from aberrant cartilage. This is a primarily metaphyseal lesion of long bones (distal femur, proximal tibia, proximal humerus) and the pelvis [1,2]. Osteochondroma comprise the most common benign bone tumor and their overall incidence is unknown as many are asymptomatic and only detected once their mass effect manifests as a cosmetic deformity, mechanical symptom or symptom of neurovascular compression [2, 3]. Osteochondromas of the foot and ankle are uncommon except in rare cases of Multiple Hereditary Exostoses. Of these cases, only a few incidents of talar osteochondromas have been reported. To our knowledge, there are no prior reports of osteochondromas in such proximity of the talus and calcaneus . A 58-year-old female administrator presented with persistent pain at her left hindfoot. Progressively worsening pain and stiffness over the prior 4-5 months were noted. Nonoperative modalities such as brace-wear and NSAID use provided limited relief of pain and associated disability. She was unable to perform High-impact activities and those on uneven ground secondary to pain. On physical examination, there was near-complete restriction of subtalar motion which was associated with severe pain on active and passive hindfoot inversion and eversion. She had a mild swelling over the anterolateral and posterolateral aspects of the ankle. Otherwise she demonstrated a benign musculoskeletal exam and was found to be without neurovascular impairment. Radiographic examination demonstrated complete joint space loss at the posterior subtalar facet with subchondral sclerosis and subchondral cyst formation as well as a large well-circumscribed exostosis posterior to the subtalar joint (Figure 1). Magnetic resonance imaging demonstrated bony excrescences at the posterior subtalar joint with disruption of the posterior facet articular surfaces. There was also underlying severe bone on bone degenerative change of the posterior facet with associated reactive edema within the talus and calcaneus (Figure 2). A cartilage cap to suggest osteochondroma was not appreciated. Two exostoses were noted to be extending posteriorly from the talus and calcaneus, respectively. Marrow continuity between talus/calcaneus and their respective prominences was consistent with a presumptive diagnosis of osteochondroma. 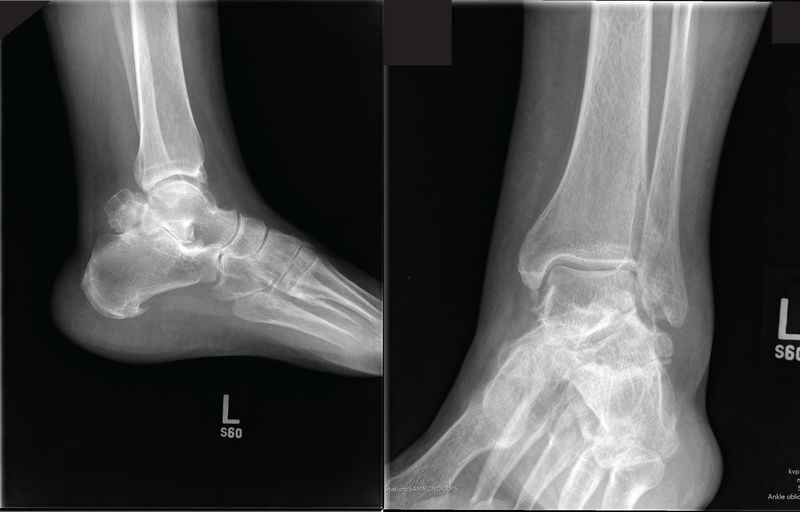 Figure 1 Lateral and Mortise views of the left ankle demonstrate severe subtalar joint space narrowing with a well circumscribed pedunculated osseous lesion projecting posteriorly from the subtalar joint. Figure 2 Sagittal imaging demonstrating a bony protuberance just posterior to the calcaneus with reactive edema about the osteochondroma as well as within the talus and calcaneus consistent with osteoarthritic changes. Axial MRI imaging demonstrates fragmentation within the osteochondroma indicative of two separate, but “kissing” lesions. The coronal image demonstrates the extensive osteoarthritic changes apparent in the subtalar joint of the patient. Given the advanced nature of the lesion and failure of nonoperative modalities, surgical intervention was proposed. 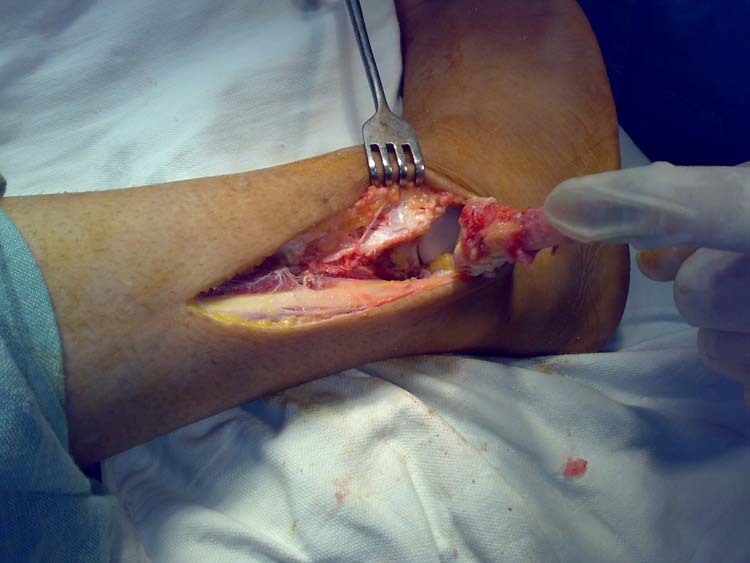 A midline incision was used , splitting the Achilles tendon centrally in a longitudinal fashion. The mass was identified deep to the FHL with its enveloping bursa (Figure 3). The mass extended from the talus to the calcaneus. The exostoses were removed at their base to the level of native contours of bone at both the talus and calcaneus (Figure 4). Subsequent inspection of the posterior facet of the subtalar joint demonstrated denuded cartilage with exposed subchondral bone. Approximately 2mm of subchondral bone was removed. A narrow osteotome was used to increase the exposed cancellous surface area. A drill bit (2mm diameter) was used to create several channels between the surface and underlying cancellous bone. Local autograft was then supplemented with an allograft demineralized bone graft substitute. In situ compression and fixation was achieved with two 6.5mm partially threaded screws across the subtalar joint (Figure 5). 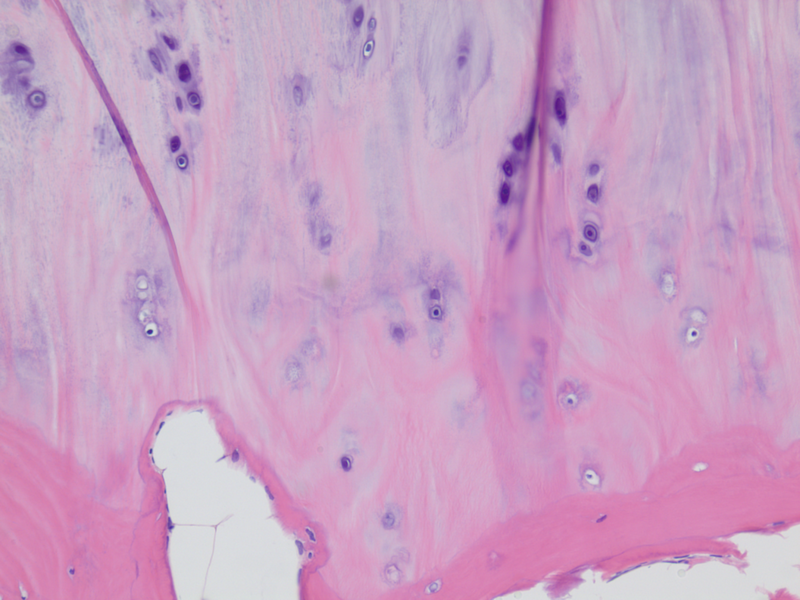 Histopathology of both specimens revealed linear columns of maturing chondrocytes within a cartilaginous cap and islands of cartilage within the bone of the stalk confirming the diagnosis of talocalcaneal osteochondromas on both sides of the joint (Figures 6 and 7). 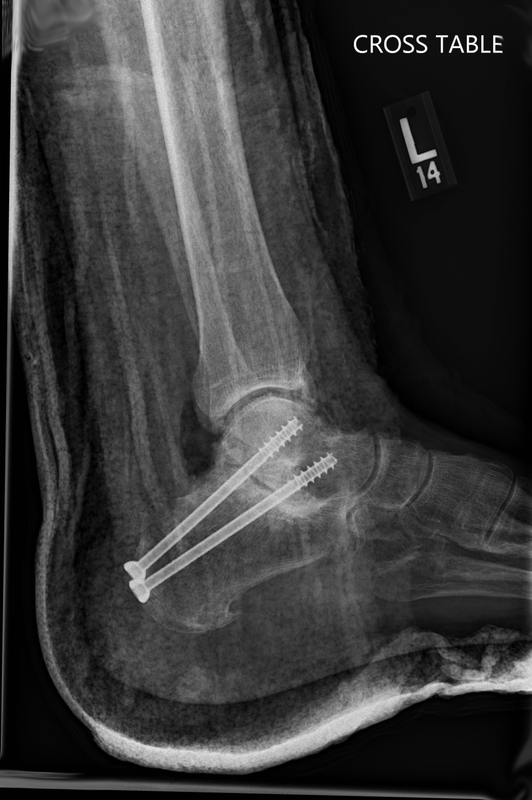 Post operatively the patient was treated with standard protocol for subtalar joint arthrodesis. She was released to full weight-bearing and regular shoe wear three months from her date of surgery. At six month and one year follow up visits the patient had returned to full activities without difficulty or pain at her left hindfoot. Figure 3 Intraoperative photo demonstrating the osteochondroma. The Achilles tendon was split longitudinally and retracted. The adjacent osteochondromas were then identified deep to the flexor hallucis longus, which was retracted medially to gain access to the lesions. Figure 4 Removal of the osteochondromas about the posterior aspect of the subtalar joint with demonstration of exposed subchondral bone. Figure 5 Lateral view of the left ankle demonstrating postoperative changes with removal of the talocalcaneal osteochondromas and subtalar arthrodesis. Figure 6 Histopathology revealed cartilaginous island with an active chondrocyte surrounded by osteoid matrix of the attached bony stalk. Figure 7 Photomicrograph of the cartilaginous cap at the margin of the exostoses demonstrates linear arrangement of active chondrocytes. Note the similar appearance to a normal physis seen in children. Osteochondromas are the most common benign bone tumor. They comprise 30 to 50% of benign bone lesion diagnoses and 15% of all bone tumors. They represent a dislocation of growth plate cartilage, where normal longitudinal growth occurs adjacent to centripetal growth of the lesion in the metaphyseal region of bone. After growth plate closure there is typically no further growth of the lesions and the cartilage cap of osteochondroma mature to a maximal thickness of 2mm . If lesions grow in adulthood they usually represent malignant transformation of the cartilage into chondrosarcoma [1, 6, 7]. Most osteochondromas grow from metaphyseal locations away from the adjacent joint. However, Trevor’s disease (Dysplasia Epiphysealis Hemimelica or DEH) or Fairbank’s disease are variants of osteochondromata in which the lesion is intra-articular and grows adjacent to joint cartilage . There are several case reports demonstrating osteochondroma of adjacent metaphyseal regions developing concurrently, eventually leading to “kissing” lesions as the osteochondroma grow [1, 2, 4, 9]. There have also been reports of DEH “kissing” lesions which grow adjacent to an affected joint and lead to pain and presentation in childhood . Osteochondromas have been reported in the literature adjacent to a periosteal chondroma forming a kissing lesion . Most of these lesions present with innocuous swelling or pain, sometimes with movement restriction or mechanical compression. Finally, they can cause intra-articular loose body formation, ankle deformity, peroneal spastic flatfoot, limb length inequality or in adults with secondary arthritis . When identified in a child, conservative management of these uniquely paired osteochondromas or periosteal chondroma is usually advocated, as surgical intervention for asymptomatic, intra-articular lesions may result in secondary arthrosis. Early surgical intervention has been advocated for metaphyseal or juxta-articular lesions to avoid complications with associated growth and deformity. In adults who present with a single osteochondroma, surgery is preferred due to the risk of malignant transformation or growth under a large tendinous sleeve at its metaphyseal insertion when a painful snapping syndrome can develop. One of the peculiarities that can develop in the adult with juxta-articular “kissing” lesions, especially in the lower extremity, is the proclivity towards arthrosis of the involved joint owing to abnormal contact stresses. This was demonstrated in our patient who had subtalar arthrosis adjacent to peri-articular talar and calcaneal osteochondroma. She may have had a Trevor’s lesion of the talus adjacent to more common osteochondroma or periosteal chondroma of the calcaneus. We observed joint effusion of the subtalar joint with high signal intensity of the adjacent talar and calcaneal bone identified on T2 and STIR sequencing as well as arthrosis on cartilage sequencing anterior to these lesions, presumably secondary to decreased mobility of the subtalar joint and a shift in the normal mechanical stresses anteriorly. In our patient’s case, she presented with peroneal impingement and subtalar arthrosis. Thus she underwent excision of osteochondroma and subsequent subtalar fusion. Decompression alone without addressing the arthritis of the patient’s subtalar joint would lead to continued pain and potential need for a second surgical intervention. We present this case as an illustration of the sequela associated with peri-articular osteochondromata of both the talus and calcaneus in the lower extremity. We hope understanding the chronic complications associated with these lesions can facilitate earlier management prior to the development of late arthritic changes. To the best of our knowledge this patient’s presentation represents a unique case of adjacent osteochondromata of the hindfoot that has not been reported previously in the literature. In this case the patient had symptomatic peroneal compression and subtalar arthrosis. Although malignant degeneration is rare, the patient’s increased age at presentation placed her at higher risk of this complication. Given this risk and the patient’s presentation, surgical intervention was performed. Awareness of such a case is important to consider when evaluating and treating hindfoot arthritis. This case highlights how careful surgical planning can appropriately evaluate for any malignant transformation while preventing the recurrence of this lesion and mitigating its complications. Funding Declaration No funding was acquired for this manuscript. Conflict of Interest Declaration The authors declare that there is no conflict of interest regarding the publication of this manuscript. Osteochondroma are believed to be most common benign tumors accounting for 36% to 41% of all such tumors. We report a rare occurrence of such a tumor in distal interosseous space of leg. In our case osteochondroma arising from distal fibula invaded the interosseous space and produced pressure effects on tibia. We believe this may be the first reported case of distal fibular osteochondroma producing pressure effects on the tibia. The tumor was excised using a transfibular approach and osteotomy site fixed with a semitubular plate. Key Words: Osteochondroma, interosseous space, pressure effects, transfibular approach. Osteochondromas are believed to be the most common benign bone tumors accounting for 36% to 41% of all such tumors. The growth of osteochondroma usually parallels that of the patient and usually ceases when skeletal maturity is reached. After an extensive literature search, there are few cases reported which mention an osteochondroma arising from distal tibia laterally and invading the interosseous space and producing pressure effects on fibula. [3,4,5] Osteochondroma arising from distal fibula along medial aspect and producing pressure effects on tibia in a skeletally mature patient does not appear to be mentioned anywhere in the literature. We present a case of a patient who reported pain to the right leg anteriorly and distally with minimal swelling. This subsequently turned out to be a benign osteochondroma arising from fibula and producing pressure effects on tibia. The tumor was excised through a transfibular approach and the patient was symptom free after one and a half year follow up. 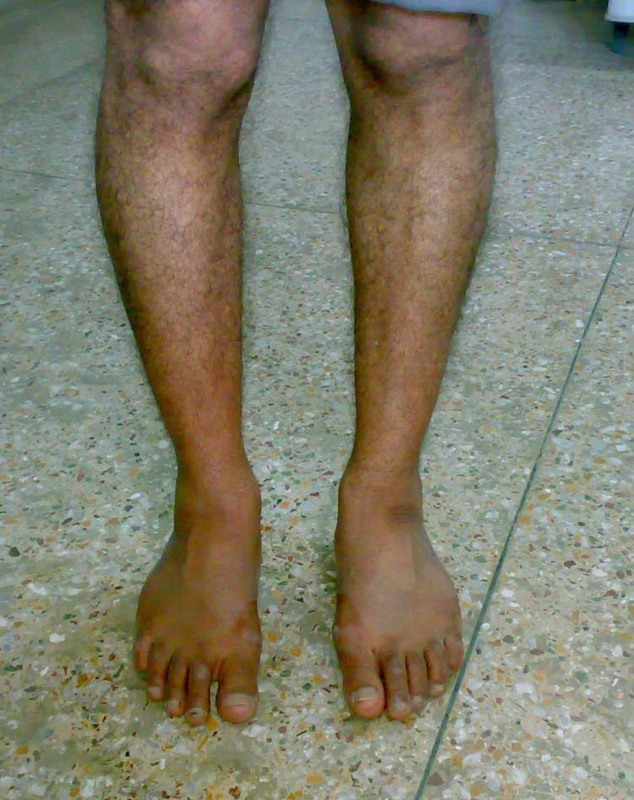 A 22 year-old male Asian Indian in origin presented to us with pain right leg. The pain was located distally and anteriorly and was associated with minimal hard to appreciate swelling. After taking a detailed history and examination it became clear that the patient had been symptomatic for about one year and was being treated by the general practitioner. Symptoms included increase in pain on weight bearing to the affected limb. Figure 1 Clinical photograph with hard to appreciate swelling on right side. There was tenderness at the distal interosseous space. Temperature was normal. All the hematological investigations were normal. 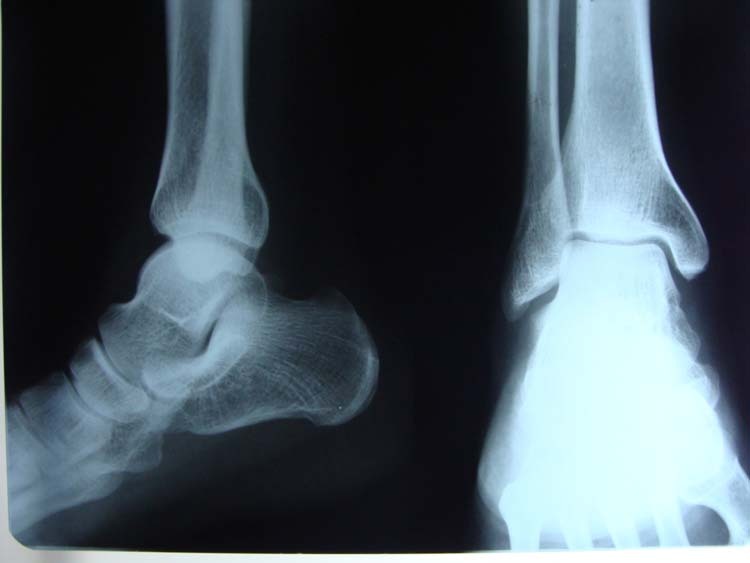 A plain and digital radiograph was ordered which showed a bony swelling arising from distal fibula and expanding into the interosseous space and communicating with the lateral aspect of tibia. (Figs. 2 and 3) A computed tomography (CT) scan was done which confirmed the diagnosis and also revealed that the tumor is producing pressure effects on tibia. (Fig. 4) By using a transfibular approach, the tumor mass was excised (Fig. 5) and sent to histopathology. The scalloping of lateral aspect of tibia was confirmed. Figure 2 Plain radiograph showing an anteroposterior and lateral view of the right ankle. 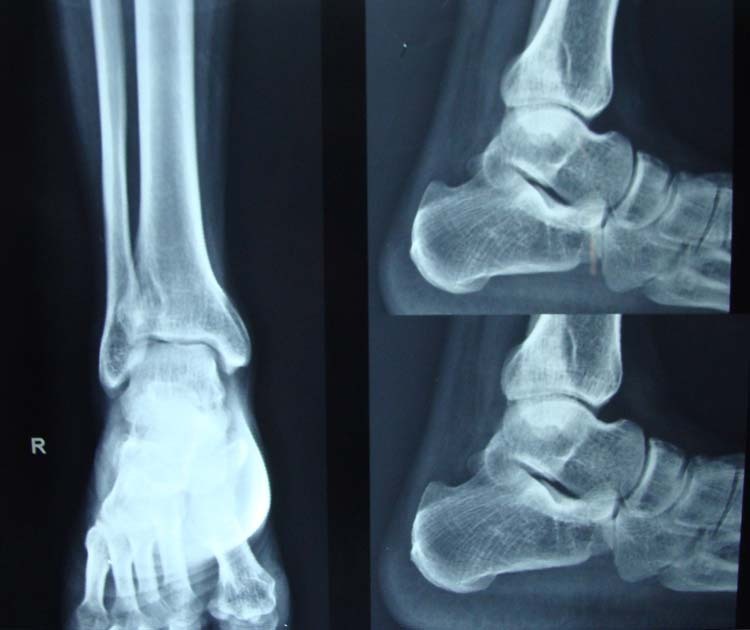 Figure 3 An anteroposterior and lateral digital radiographic views of the right ankle. Figure 4 Computed tomography scans of the patient. 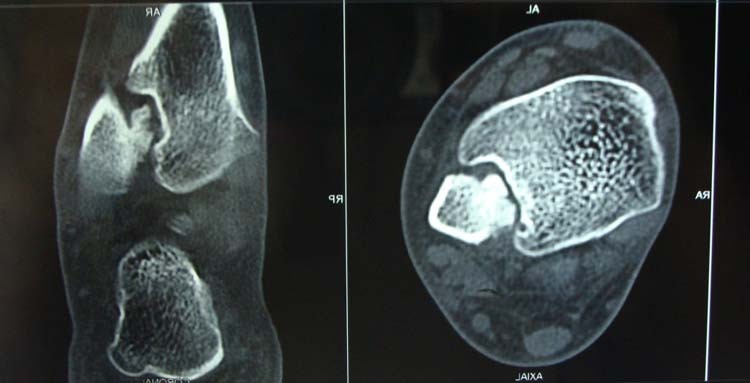 Figure 5 Intra operative photograph after fibular osteotomy showing tumor and pressure effects on tibia. The osteotomy site was fixed using a semitubular plate and distal syndesmotic screw was used to fix the syndesmosis. Histological examination showed typical appearance of a benign osteochondroma with no evidence of malignant transformation. The patient had an uneventful recovery with no evidence of recurrence two years after surgery. The ankle range of motion was normal when patient was last evaluated. Osteochondromas are common benign bone tumors and most often occur in the metaphyseal area of distal femur, proximal tibia, and proximal humerus. Distal radius, distal tibia, proximal and distal fibula and sometimes flat bones like ilium and scapulae are other areas where osteochondromas can occur. There have been many theories proposed to explain the occurrence of osteochondromas. Virchow’s physeal theory , Keith’s defect in perichondrial ring , Muller’s theory of presence of small nests of cartilage  are a few to mention. Current thought is that osteochondroma results because of misdirected growth of a portion of the physeal plate. Osteochondroma may be sessile or pedunculated. The tumor often resembles a cauliflower and is covered by a cartilaginous cap usually 1 to 3mm thick. The cartilaginous cap is composed of bland hyaline cartilage with no cellular atypia. Malignant degeneration should be considered if there is an increase in the thickness of cartilage which becomes evident in an adult. In the reviewed literature, there are few cases reported which mention osteochondroma arising from distal tibia laterally and invading the interosseous space and producing pressure effects on fibula. [3,4,5] We could have used the anterior approach to excise the tumor, but rather a transfibular approach was performed as advised by Gupte, et al. Although , this approach has been used for a tibial osteochondroma, it proved to be an excellent method of visualizing the tumor for complete excision.(Fig. 5) Again, this may be the first reported case of an osteochondroma arising from the distal fibula invading the interosseous space and producing effects on the tibia. AS and MMW designed the study, wrote the manuscript, performed literature review, MAH, IW, AB and BAM helped in literature review and drafting the final manuscript. All authors read and approved the final manuscript. 1.Schajowicz F. Tumors and Tumor like lesions of Bone and Joints. 1981, New York, Springer-Verlag. 2.Chrisman OD, Goldenberg RR. Untreated solitary osteochondroma. Report of two cases. JBJS 1968 50A: 508-512. 3.Galasso O, Mariconda M, Milano C. An enlarging distal tibia osteochondroma in the adult patient. JAPMA 2009 99(2): 157-161. 4.Danielsson LG, el-Haddad I, Quadros O. Distal tibial osteochondroma deforming the fibula. Acta Orthop Scand. 1990 61(5): 469-470. 5. Spatz DK, Guille JT, Kumar SJ. 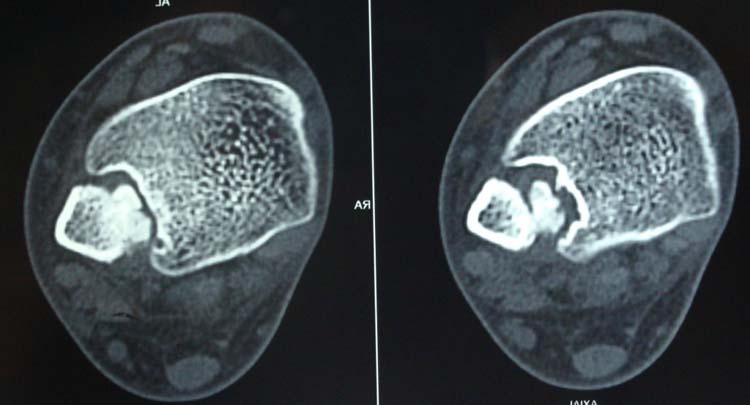 Distal tibiofibular diastasis secondary to osteochondroma in a child. Clin Orthop Relat Res 1997 (345): 195-197. 6.Essadki B, Moujtahid M, Lamine A, Fikry T, Essadki O, Zryouil B. Solitary osteochondroma of the limbs: clinical review of 76 cases and pathogenic hypothesis [in French]. Acta Orthop Belg 2000 66: 146-153. 7.Virchow R (1891). Ueber multiple exostosen, mit vorlegung von praparaten. Klin Wochenschr 28: 1082-1085. 8.Keith A. Studies on the anatomical changes which accompany certain growth disorders of the human body. J Anat 1920 54:101-106. 10.Anderson RL, Popowitz L, Li KH. An unusual sarcoma arising in a solitary osteochondroma. JBJS 1969 SIA: 1199-1204. 11. El-Khoury GV, Bassett GS. Symptomatic bursa formation with osteochondromas. AJR Am J Roentgenol 1979 133: 895-898. 12. Ferriter P, Hirschy J, Kesseler H, Scott WN. Popliteal pseudoaneurysm. A case report. JBJS 1983 65A: 695-697. 13. Garrison RC, Unni KK, McLeod RA, Pritchard DJ, Dahlin, DC (1982). Chondrosarcoma arising in osteochondroma. Cancer 49: 1890-1897. 14.Unger EC, Gilula LA, Kyriakos M. Case report 430: ischemic necrosis of osteochondroma of tibia. Skel Radiol 1987 16: 416-421. 15.Lange RH, Lange TA, Rao BK. Correlative radiographic, scintigraphic, and histological evaluation of exostoses. JBJS 1984 66A: 1454-1459. 16.Gupte CM, Dasgupta R, Beverly MC. The transfibular approach for distal tibial osteochondroma: an alternative technique for excision. J Foot Ankle Surg 2003 42(2): 95-98. Address correspondence to: Asif Sultan. Government hospital for bone and joint surgery, Barzullah, Srinagar, India 190005. 1 Government hospital for bone and joint surgery, Barzullah, Srinagar, India 190005. Osteochondroma is the most common benign bone tumor of the foot. This case describes a teenage girl who returns one year later with recurrent osteochondroma. The etiology, diagnosis and treatment options of this tumor are discussed. After initial excision, a revisional surgery was performed one year later that included more aggressive curettage of the recurrent osteochondroma with allogenic bone grafting using InterGro® DBM Plus. Key words: Subungual tumor, osteochondroma, subungual exostosis. The most commonly reported transformation is to a chondrosarcoma. The potential for malignant transformation occurs more often in the hereditary disorder called hereditary multiple cartilaginous exostoses. Malignant transformation to osteogenic sarcoma has also been reported, but not in solitary, subungual osteochondromas. As a subungual tumor, the lesion usually protrudes up through the soft nail bed and appears as firm, slightly lobulated, marble-like or sometimes translucent cartilaginous bone that causes onycholysis of the nail plate. It can appear strikingly similar to enchondromas and glomus tumors. On gross examination, enchondromas also have a cartilaginous cap and appear lobulated, glassy, gray-blue and translucent as the tumor erodes through cortical bone. Unlike osteochondromas that originate from the metaphyseal surface of the bone, enchondromas occur deep within the spongiosa of bone. Glomus tumor or glomangioma is a common benign tumor of the fingers and toes that manifest under the nail. Glomangiomas are supplied with an efferent artery, AV anastomoses and efferent veins measuring about 5mm in diameter on average. This gives the lesion nodular, firm consistency and its distinctive red-blue color. Differential diagnosis of osteochondroma includes enchondroma, pyogenic granuloma, verruca vulgaris, lipoma, nonossifying fibroma, glomangioma, simple bone cyst, unicameral bone cyst, fibrous dysplasia, eosinophilic granuloma, chondroblastoma, chondromyxoid fibroma, osteogenic sarcoma or clear cell chondrosarcoma. [1,2,3,4] A case report of a young girl is presented. She initially presented with a typical, subungual osteochrondroma which was surgically removed. One year following her surgery, she presented to our office with recurrence of the tumor. A 15 year-old female presented to our office on February 1, 2006 with pain to the right hallux. She was also concerned that the nail was ‘discolored’ with a possible fungal infection. (Fig. 1). 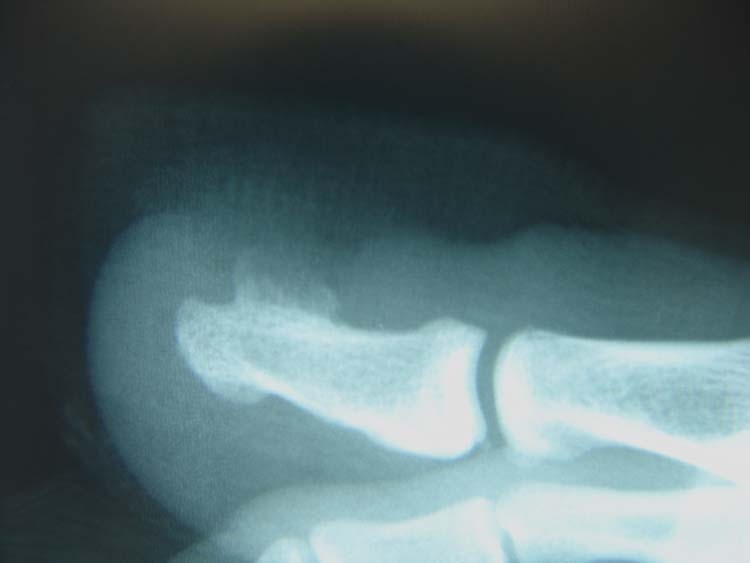 Figure 1 A 15 year-old female presents with painful right hallux nail. She is active in volleyball and track. The nail plate has distinctive color changes and partial onycholysis of the nail plate. Her initial concern was possible ‘toenail fungus’ and ‘pain’. 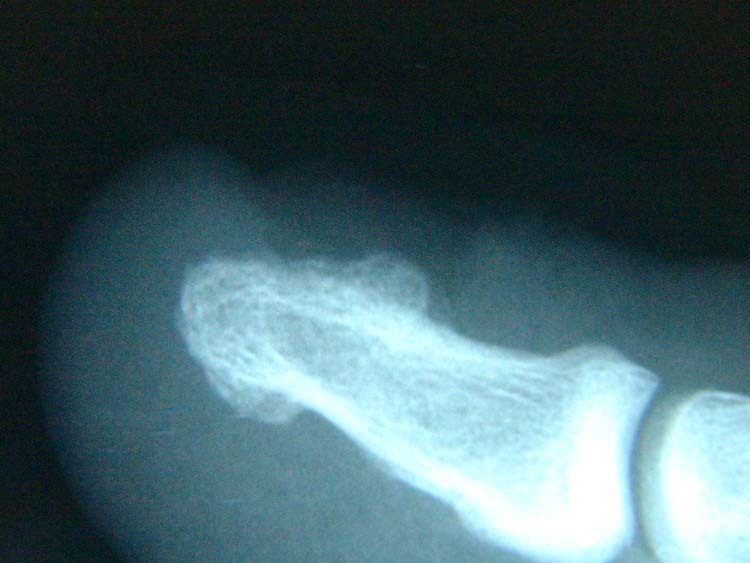 Figure 2 Hallux views reveal a large subungual exostosis arising from the metaphyseal portion of the distal phalanx. The lesion was simply removed by simple exostectomy. A rongeur was used to remove the lesion and a small depression was made in the bone. The surrounding soft tissue nail bed was gently placed in the depression and then dressed with Adaptic™ and cotton-gauze dressing. The patient was sent home and placed in a Darco™ shoe for about 2 weeks. A few days after the procedure, her dressings were removed. The nail bed already revealed signs of tissue healing. (Fig 4) The nail bed healed and she returned to full activity about 2 months after the procedure. Figure 3 Removal of the nail plate reveals a lobulated, irregular, firm nodule with a distinctive translucent cartilaginous cap. Differential diagnosis include osteochondroma, enchondroma, chondroblastoma or other tumors of cartilaginous origin. Figure 4 A few days after the excision of the tumor, healing of the nail bed is seen. The initial gross specimen was received in formalin measuring 1.5 x 1.3 x 0.3 cm in aggregate. Microscopic evaluation revealed subungual skin showing psoriasiform squamous epithelial hyperplasia. Adjacent area was present containing fibroblastic and fibrohistiocytic cellular elements. Plump fibroblasts were detected, accompanied by multi-nucleated giant cells in a background of patchy chronic inflammation. The fibroblastic zone contained small fragments of devitalized mature lamellar bone. Other fields showed reactive or woven bone. The patient returned in late 2006 with complete re-growth of the nail plate. The nail continued to be thick. In early February 2007, the patient re-presented to our office with recurrent pain almost 1 year to the day of her previous exostectomy. The nail appeared loose with attachment proximally at the epinychial nail fold. The patient reported the nail “fell off”. (Fig. 5) Radiographs were ordered which revealed a small, recurrent region of exostosis from the metaphyseal portion of bone in the same location as the previous tumor. (Fig. 6) The patient was then scheduled for a more aggressive resection of the tumor. Figure 5 The patient presented almost 1 year later with similar, recurrent pain to the hallux. Inspection of the hallux reveals nail bed changes were consistent with recurrent tumor in the exact location as the previous excision. Figure 6 Recurrent bone growth was seen in the exact location as the previous tumor that was resected 1 year prior. Figure 8A and 8B The high-speed burr was used to punch holes in the base of the saucerized bone. 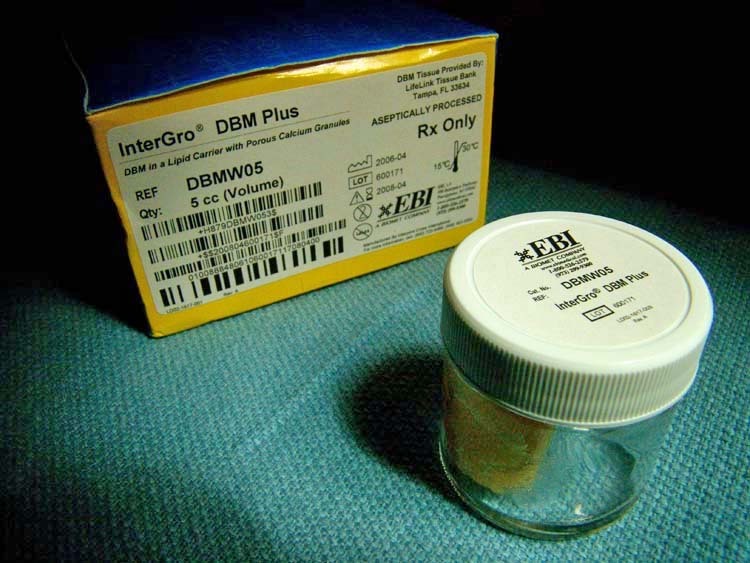 InterGro® DBM was then placed into the defect to fill the space. The region was then dressed with Adaptic™ gauze and cotton ball dressing. Recurrence of the tumor is likely caused by cells of the resected perichondrium or cartilage cap that is left behind in unresected bone or nail bed. During the initial removal, it is possible some cells may have been left behind by simple excision without aggressive curettage of bone or adjuvant procedures to destroy the perichondrium. 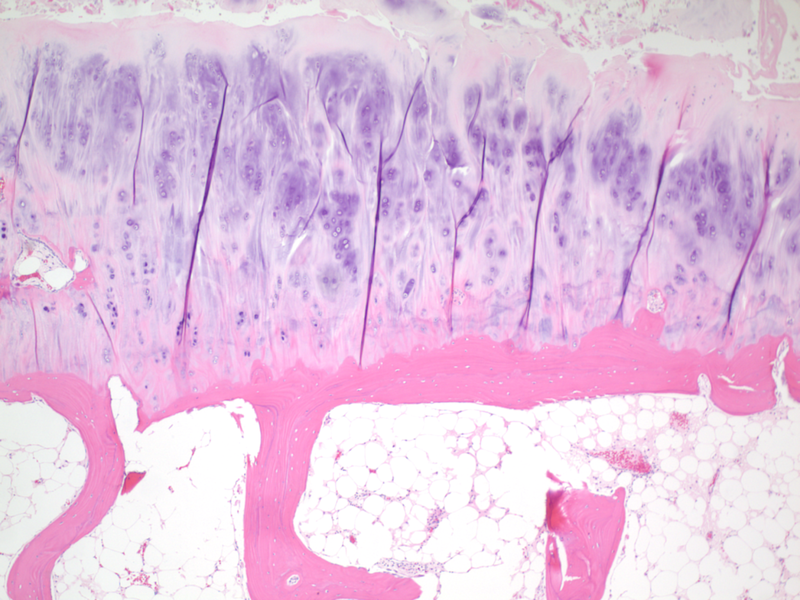 Tuzuner et, al., also introduced an important distinction between subungual exostosis and osteochondroma.1 However, our histologic findings revealed some similarities to subungual exostosis, but were histologically more consistent with osteochondroma. It is the author’s opinion that since the tumor recurred, it is best to initially treat any subungual lesion aggressively by saucerization rather than simple exostectomy. Treatment options can include ablation, cauterization and the use of allogenic or autogenous bone graft following curettage of the lesion. In this case, it was decided to saucerize and curettage the lesion with a high-speed burr and pack the area with allogenic bone graft. To date, no recurrence has been reported. 1. Tuzuner T, Kavak A, Parlak AH, Ustundag N: Subungual osteochondroma. JAPMA 96 (2): 154 – 157, 2006. 2. Robbins SL, Kumar V: Osteochondroma. Basic Pathology. 4th ed. W.B. Saunders. 711, 1987. 3. American Academy of Orthopaedic Surgeons: Osteochondroma (Bone Tumor). July, 2004. Al is this an internet reference? 4. Dickey ID: Solitary osteochondroma. Emedicine, 2004. http://emedicine.medscape.com/article/1256477-overview Accessed 23rd January 2010. 5. Sheff JS, Wang S: Extraskeletal osteochondroma of the foot. JFAS 44 (1): 57 – 59, 2005. 6. Eliezri YD, Taylor SC: Subungual osteochondroma: Diagnosis and management. J Derm Surg Oncol 18: 753 – 758, 1992. 7. Kinoshita G, Matsumoto M, Maruoka T, Shiraki T, Tsunemi K, Futani H, Maruo S: Bone and soft tissue tumours of the foot: review of 83 cases. Jour of Ortho Surg. 10 (2): 173 – 178, 2002. 8. EBI® : InterGro® product insert. Adjunct Clinical Faculty, Temple University School of Podiatric Medicine, Barry University School of Podiatric Medicine. Private practice, Chief of Podiatry, Doctors Regional Medical Center. Corpus Christi, Texas, 78411.